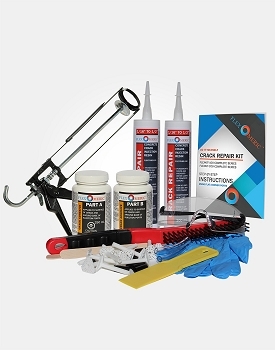 Our DIY foundation crack repair kits are designed to repair concrete cracks using the same low-pressure injection method used by professional waterproofing contractors. Our resins are formulated to react with water and only require the use of a standard caulking gun. 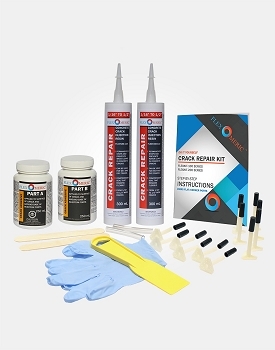 Which DIY foundation crack repair kit do I need? Some concrete cracks are uniform in width and others may range from being wider at the top than the bottom or vice versa. It is important to measure the smallest width of the crack as the injection material needs to be able to penetrate this part of the crack. A quarter coin is approximately 1/16" thick, so you can use one as a guide. Measure the smallest width of the crack. If you try placing a quarter inside the thinnest part of the crack and it fits, use the FLEXKIT-100. Otherwise, use FLEXKIT-200. What surfaces can this kit repair? Most typical concrete structures, such as basement foundations, concrete pools, patios, driveways, garages, and more. How much does this kit cover? Each tube repairs up to 8 linear feet of concrete cracks, assuming 8" thick foundation wall, and up to 1/2" wide. Can the surface adhesive be removed? Yes, the surface adhesive can be removed simply by using a heat gun to reverse the material's hardness and scraping it off.